Almost eighteen and still a virgin, Jace has only one one thing on his mind. Luckily, he'll be spending his birthday at a Mexican resort, where beaches draped with golden girls should increase his odds of success. On the other hand, vacationing with his mother, aunt, and nine-year-old autistic brother threatens to kill that bet. Then he meets Kate, who might be just the person to help him, and Connor, God's gift to women, who could share some pointers if he weren't such a jerk. But making "it" happen is harder than Jace realizes. As both old and new secrets rise to the surface, he must navigate the space between the lies that keep everyone afloat and the truth that could drag all of them under. QUESTION: Where did the idea for The Space Between come from? 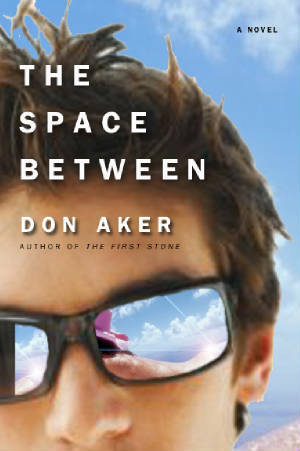 DON: All of my novels (including the one I’m working on right now) have grown out of experiences that have troubled me, and I’d been thinking about the idea behind The Space Between for several years. Three people in my life committed suicide, one of them a family member, and all three taught me that the narrative of suicide is always the story of those people left behind struggling to cope with a sudden, tragic loss. This, of course, is Jace’s story. QUESTION: Why did you have Jace’s brother commit suicide? Why not a close friend? DON: A brother brought a built-in connection, something that readers could relate to without tons of backstory. Making that character a friend would have required me to spend time developing his relationship with Jace so readers could understand the connection they shared, but I wanted this to be Jace’s story, not the story of the person who killed himself. Most people have siblings, so readers can tap into whatever dynamic exists between them and a brother or a sister. A more important reason for using Jace’s brother instead of a friend, though, is that the suicide had to impact all members of Jace’s family equally, something that wouldn’t have been likely if one of his friends had killed himself. QUESTION: Jace is the middle sibling in his family. Is there really such a thing as Middle Child Syndrome, or did you invent that for your story? DON: To be honest, I thought I was inventing it. I’m a middle child, and I know what it’s like to get lost in the space between older and younger siblings. My older sister was a phenomenal student who graduated at the top of her class (me, not so much), and my younger brother had a number of medical problems in the first few years of his life, so it was easy to get overlooked sometimes. I’m not criticizing my parents when I say this because it’s hard to give every child equal attention, especially if some require more than others. But as I was creating the story in my head, I thought about my own teenage years, and I decided this was a detail that might make readers empathize with Jace, so I gave it a name—Middle Child Syndrome. Imagine my surprise when I discovered that it actually exists. QUESTION: So would you say that Jace is a lot like you were at that age? DON: I think it’s safe to say that any writer’s main characters resemble him or her in many ways. I really like Guy de Maupassant’s comment about writers and their characters: “Whether we are describing a king, an assassin, a thief, an honest man, a prostitute, a nun, a young girl, or a stallholder in a market, it is always ourselves that we are describing.” There’s a part of me in every one of my main characters. QUESTION: In Jace’s case, though, it seems like a big part. You said that, like Jace, you lost a family member to suicide and, like Jace, you were a middle child. Is The Space Between more autobiography than fiction? DON: I always draw on my own experiences as I write, regardless what story I’m telling. Jace is probably more like me than any other character I’ve created, but The Space Between is still fiction. QUESTION: Why did you choose to place your story in Mexico? Why not have it unfold in Halifax? DON: Three reasons. First, all of my previous novels had been set in Nova Scotia and this time I wanted to explore different territory, both geographic and literary. Second, I felt this story needed an exotic location. Putting my characters in a place that was completely unfamiliar to them made them more open to discovery. As they were learning about their new surroundings, they were also learning things about themselves. The most important reason, though, is that I didn’t want to have to include Jace’s father in the narrative, which would have been necessary had I set the story in Halifax. Jace’s relationship with his father was a complex one, and I liked bringing it in bit by bit through flashbacks as it related to what was happening in present-tense Mexico. And leaving Jace’s dad behind in Halifax gave him the opportunity to destroy the garage without Jace (and the reader) learning about it until the end of the novel. I liked how this single act gave closure to the story—not only did it show how Jace’s father was moving on in his grief but also how his relationship with Jace had reached a turning point. When he asks Jace whether he’s done the right thing by tearing down the garage, he’s speaking to Jace as an equal rather than simply as a father. The whole dynamic of their relationship has changed at this point, which, I hope, offers readers a sense of hope in an otherwise grim story. QUESTION: So having Jace’s father destroy the garage at the end was something you’d planned from the beginning? DON: I wish I could say yes, but it wasn’t. In fact, in my first draft of the novel, Jace’s father doesn’t touch the garage. It was my wife who suggested that this should happen, and I’m so glad that she did. QUESTION: So you don’t plan your novels before you write them? DON: No, I don’t—not consciously, anyway. As I write, characters simply appear and events simply happen, and it’s my job to make sense of them. For example, I had no idea who Connor was when he and his buddies appeared in the scene at the airport the morning that Jace and his family flew to Mexico. I had no idea how Connor would factor into Jace’s situation, but I just kept writing and hoping that he would tell me. And he did. QUESTION: But the answer to that seems obvious. You needed a character who would help Jace discover why his brother had committed suicide. DON: That makes sense, but when I began writing the novel, I actually had no idea why Stefan committed suicide. QUESTION: Seriously? His reason plays such an important part in the story. DON: All I knew was that my main character’s brother had killed himself and Jace hadn’t yet come to terms with his death. I really struggled with the reason because Stefan had so much going for him. In fact, he had everything to live for, and the more I wrote, the more I felt like I was painting myself into a corner. I was a hundred pages into the first draft and I still had no idea why he would want to take his own life, which worried me, but that pretty much sums up my process. For me, writing is all about opening myself up to possibility. When a character suddenly appears in my head and on the page, I have to trust that he or she will serve a purpose at some point and it’s my job to find out what it is. That’s what happened with Connor. QUESTION: Did anything in particular help you figure out Stefan’s backstory? DON: Yes. During lunchtime one day at school, I was in my classroom chatting with two of my students and, out of the blue, one of them made one of the most compelling statements I’d ever heard from a young person. His comment resonated with me for days, and I eventually realized that his statement held the reason I’d been waiting for all along. QUESTION: What comment did your student make? DON: That’s a “spoiler”—telling it here would give away too much of the story for people who haven’t yet read the novel. I’ll tell you this much, though—Connor eventually makes the same comment to Jace while sitting on Jace’s balcony at the Mayan Empress. QUESTION: Do your students often influence your writing? DON: All the time. I consider myself very fortunate to be a teacher as well as a writer of young adult novels. My students are the audience I write for but, more importantly, theirs are the stories I share. QUESTION: Mexico almost seems to become a character in the story because you include so much detail about it. Where did you get your information? DON: I can’t write effectively about places—or anything else, for that matter—if I’ve never experienced them, so I always do lots of research. When I decided to set this novel in Mexico, I knew I would have to go there, so I took my family to the Mayan Riviera and ended up using several of my own experiences in the story. DON: We toured the ruins at Tulum, swam at Xel-ha, shopped at Playa del Carmen, all of which Jace does in the novel. And the place where we stayed was a five-star resort much like the Mayan Empress. We even had the same server each evening in the dining room, and his name was Nabor, like in the novel. QUESTION: That sounds a lot like autobiography to me. DON: It’s still fiction, but my ultimate goal is to achieve a sense of realism when I write, so I’ll take that as a compliment. QUESTION: You left Connor’s story hanging at the end. Why? DON: The Space Between is Jace’s story, not Connor’s. Once Connor served his purpose, I didn’t feel obligated to delve into his situation further. Besides, life isn’t tidy. As human beings, we don’t always learn the answers to all of our questions—we’re often forced to imagine how things worked out for people who are no longer part of our lives. In the same way, readers will have to imagine what happened to Connor. QUESTION: Have you ever thought of writing a novel with Connor as the main character and exploring what happened to him after he returned from Mexico? DON: You know, a number of people have asked me that same question and, initially, I said no. However, something happened recently that made me rethink that. I guess I’ll just have to wait and see if I’m troubled enough to want to write his story to sort it all out.